requires only slightly more floor space than the containers used with it. Available in pushbutton or footswitch control. Note: Forks are adjustable from 8 1/2" to 27" outside to outside. Safety Standard for Industrial Scissors Lifts. 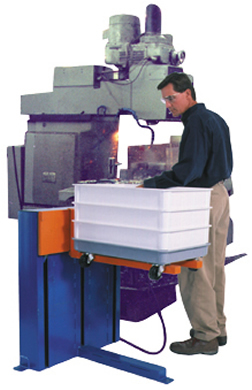 As standard, all Stack Box Positioners are shipped with 26" long removable forks, internally mounted 1 HP power unit, reservoir filled with hydraulic oil and a 10 ft. long prewired power and control cord. They are painted blue with orange forks. As standard, all positioners are supplied with all appropriate electric controls to operate the equipment. NEMA 1, up/down, footswitch with safety cover with 10' control cord. NEMA 4, up/down, hand held pushbutton with magnet and 10' control cord. Overall dimensions in chart include lag plates. 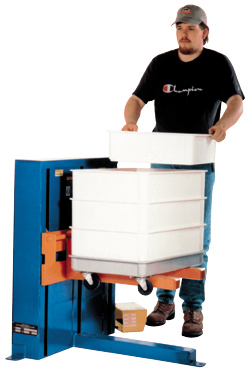 from rolling when the positioner is in any raised position.